← Reflecting: What an Awesome Year 2011 Was! As we begin flying through the new 2012 calendar and say “whew” after running my first event of the new year, it is time to outline my goals for the year. Instead of doing a half dozen events, I feel like 2012 should be the year of simple and calculated performance. Let’s focus on one or two larger goals and let the rest fall in as they come. Recognizing the diversity of the triathlon sport, 2012 will be the year to step up. First, I will complete my first “long” course triathlon. This means swimming a mile in the ocean (really? ), biking fives time longer than a sprint, and running more than 3x’s the distance. But, that’s how we roll and continually improve our performance. The event of choice for my first long course triathlon is none other than my home town event, the Santa Barbara Triathlon on August 25th. Why travel when you can roll out of bed 45 minutes before start and still wait for horn? To read more about the daunting 1-mile swim, 34-mile bike, and 10-mile run ahead, check out the course description. After surviving my first long course, I thought it would be an excellent recovery opportunity to finish the Carpinteria Triathlon Sprint in the fastest time possible on September 30th. After going long, the shorter distances are going to be a breeze (I say that now!). The Carp Tri is my favorite and I can’t think of any better way to end the season with a solid showing on a course that I love so much. But, my biggest goal yet, which is not necessarily directly related to training, but is fitness oriented, is going to be awesomer. 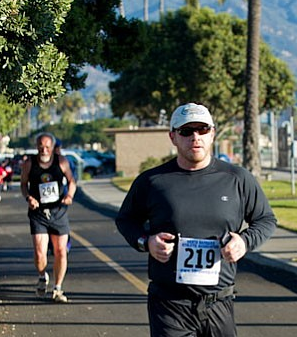 I am directing the Goleta Duathlon, held on May 20, 2012 in the “Good Land” of Goleta, California. The best part about a duathlon (run-bike-run) is the lack of swimming with the sharks! I am still in the process of obtaining permits, I can’t wait to share a bit of California’s Central Coast with other athletes and allow them to share in this memorable event. From now to May 21st, life is going to be interesting. Of course, an individual needs their “fun” goals as well. Life can’t be all training and race directing. This year I decided to get back in the kitchen and cook! The goal is to make every recipe (minus recipes with allergies) in a paleo cookbook from cover to cover. The book for 2012 is Paleo Comfort Food by the Mayfields. I’ve owned this book for a while, but haven’t had a chance to really dive into the scrumptious recipes inside. By the end of this year, though, I will be a paleo comfort food master! Wish me luck! I set the bar extremely high, but I know I can achieve! This entry was posted in Competitions, Cycling, Duathlon, Fitness, Gear, Paleo Diet, Running, Trail Running, Triathlon, triathlon training and tagged 2012 Goals, Carpinteria Triathlon, Goleta Duathlon, Paleo Diet, Santa Barbara Triathlon, Triathlon, triathlon training. Bookmark the permalink. 2 Responses to The New Year Brings New Goals! I do wish you luck. I ran two Olympic distance triathlons last year. Both were done at a friends house as our base and it was awesome. I ride and run the distance every Saturday, actually a little further, to train – at least til the snow flies. I belong to a Saturday morning running club and we decided to start doing the triathlons on an annual basis. Most fun I’ve ever had and after only running to keep from getting fat for ten years, I’m down to the weight I was when I got married. Congratulations on your weight and sticking with it. Setting the goal is one thing, but sticking with it is another. Thanks for the comment!